It is designed to be the most efficient and cost effective method for you to carry out local data mapping and rapid need assessments. 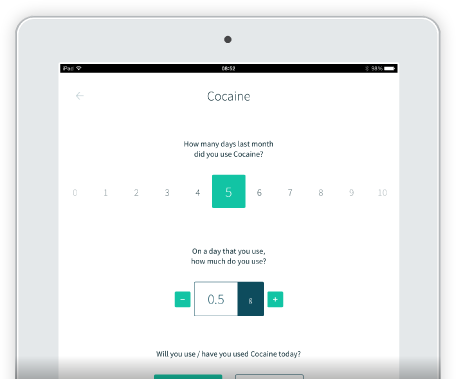 It is a simple and quick way of mapping drug use data to precise geographical locations and collecting anonymous data on large numbers of people without the need for paper based questionnaires. Designed to work in the nighttime economy or any community or healthcare setting this tablet based tool takes 2–4 minutes to complete and will allow you to obtain rapid data on last year, last month and that day’s drug use and as well as calculation and feedback of that day’s alcohol consumption in units and calories and food equivalents. The drugs meter mini can thus help with rapid needs analyses within a clinic or entertainment setting, research data collection or data mapping exercises. The Drugs Meter Mini is effective when employed in the field, such as outside entertainment venues to map local drug and alcohol use and quickly pick up on use of new or emerging drug trends. Currently PHE and regional Public Health authorities rely on secondary data (e.g. hospital, seizures, treatment seeking) to pick up on use of new drugs. Such approaches by default only pick up on a tiny minority if users, those who experience an adverse events or develop dependence related to use. We can usually provide a data report back to you 72 hours after data submission. The drugs meter mini would therefore complement epidemiological approaches. Data from the Drugs Meter Mini could be triangulated with existing data sources to help detect new drugs long before they are included on regular surveys. Real time, accurate data would inform public health strategy and health promotion campaigns. Beautifully designed and easy to use it is the most efficient and cost effective method for you to carry out local data mapping and rapid need assessments.